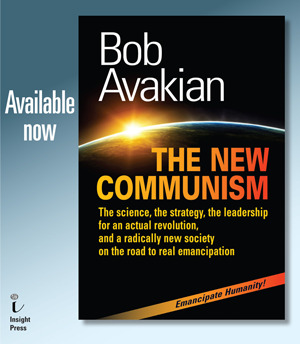 Editors' note: The following is an excerpt from the new work by Bob Avakian, THE NEW COMMUNISM. In addition to excerpts already posted on revcom.us, we will be running further excerpts from time to time on both revcom.us and in Revolution newspaper. These excerpts should serve as encouragement and inspiration for people to get into the work as a whole, which is available as a book from Insight Press. 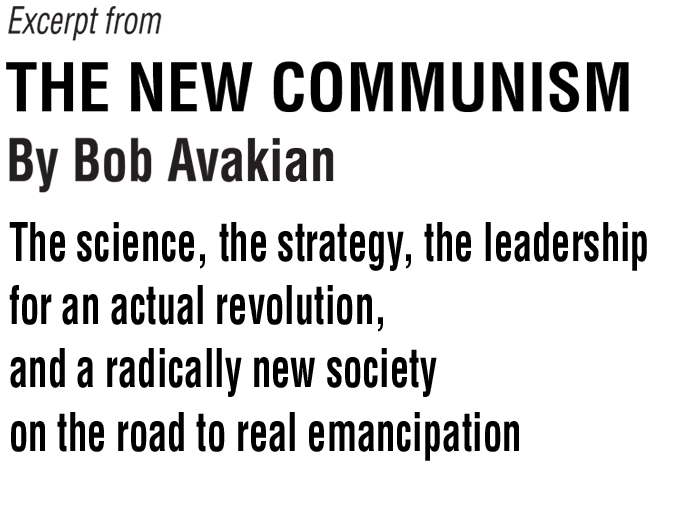 A prepublication copy is available on line at revcom.us. This excerpt comes from the section titled "II. Socialism and the Advance to Communism: A Radically Different Way the World Could Be, A Road to Real Emancipation." We should be popularizing this in a very bold way. People often raise the criticism to us: “You always say what you’re against—you’re very negative, you’re against this, you’re against that, you always say what you’re against—but you don’t say what you’re for.” Well, yes, we do—and guess what, it’s not the Democratic Party! But here’s what we’re for—right here, right in this Constitution. A lot of grappling with contradictions went into this Constitution. As I said, it wasn’t just: “Let’s come up with things that will appeal to this group, and things that will appeal to that group.” That’s not how we proceeded at all. It was a matter of doing the best possible—it was dealing in the best possible way with the contradictions that could be anticipated, and what are the principles and guidelines that should be followed to deal with these contradictions. And some of it is very detailed and very precise. People should grapple with, and people should utilize, this document in that kind of way, with that kind of understanding. Or let’s take another contradiction: Why is the possibility of a draft, for the armed forces of the New Socialist Republic, included in this Constitution? Why doesn’t it say that you can just rely on people volunteering? Well, it does make the point that people volunteering is the main aspect—the main thing that should be relied on—winning people politically and ideologically. In a discussion I had with someone who grew up in China, they said that when China was a socialist country, people in China—the youth in particular—were just tremendously inspired to join the People’s Liberation Army, to defend the socialist state and back up the revolution in the world. People wanted to do this, they wanted to be defenders of the revolution. So there is a lot of that sentiment and orientation that can be relied on. On the other hand, there’s a relation between necessity and freedom here, that you’re going to be dealing with. Why does it say, in this Constitution, that you can’t teach creationism in the schools, that the science of evolution is going to be taught as a fact? Why not just leave it up to people to decide, why not see if anybody likes creationism and wants it taught in the schools? No! You have to set certain terms—this point has been repeatedly emphasized, and for good reason—you have to set certain terms. That’s the solid core you set—and you actually create necessity for other forces by setting certain terms. And then you struggle things out on that basis. This point has been illustrated by using the example of the movie, from a few years ago, Remember the Titans. In the situation that movie was dealing with, in a city in the South several decades ago, they integrated the schools there, they integrated the football team in what had been essentially an all-white school, and they even replaced the previous white coach with a Black football coach. And then they said: Now, let’s deal with the struggle that has to be waged around this. They didn’t go to all the white people and say: “Do you want to integrate the school and integrate the football team and, on top of it, have a Black coach for the football team?” Guess what they would have said? There are all kinds of things like that in this Constitution. Why does it talk about socializing ownership of the means of production? Why not just leave it to people to vote how they want the economy to run? Because you have to have a solid core, certain fundamental principles, and you have to set terms and create certain necessity. And we aren’t yet at the point—and we won’t be at the beginning stage that this Constitution is talking about—where you can rely solely on people volunteering for the armed forces if the very existence of your republic is in danger. There’s a certain necessity you put on people. Now, if you rely on that, then you’re on a slippery slope toward becoming like a bourgeois state, and you’re exercising power more and more in that way. But, put it this way: There is a certain value and importance, when you have the freedom to do so, to set certain necessity, to set certain terms, and then struggle things out from that standpoint. Returning to "On the Possibility of Revolution"